When I found out that a plain ol’ every day shamrock was $0.99 in the Silhouette online store I scoffed at the price. A buck for a simple shape? I could get some insanely creative cut files for that buck. Since I work with Adobe software almost daily, I figured it would be a snap and I’d just get it done and move on. I had hand drawn my shamrock shape and scanned it in and tried to trace on top of my scanned image in Silhouette Studio. Disaster. Total. Freakin’. Nightmare. I still have no clue how to draw with that silly thing . 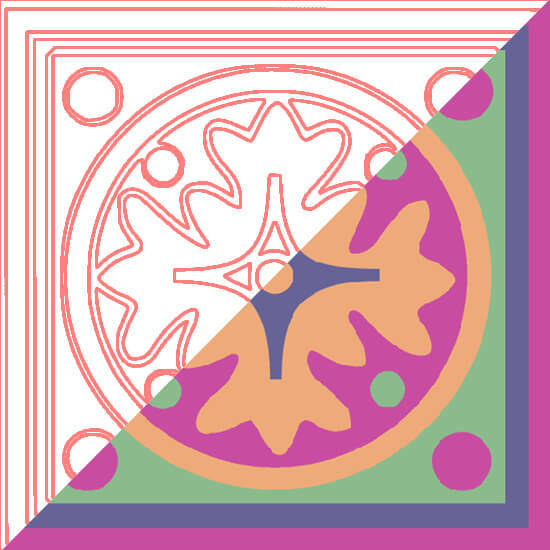 After that epic failure, I decided to draw the shape in Illustrator and then try to figure out a way to work with it from there. Luckily, I did get something figured out and you may already know this, but if you’re new like me, this info could possibly save you a considerable amount of time! 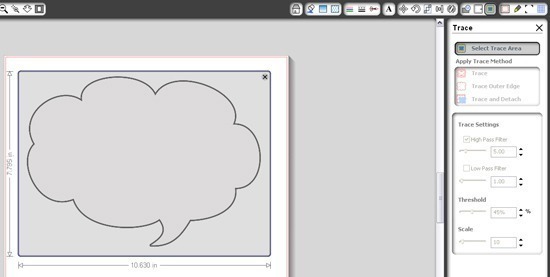 Today I’m going to show you how to take GIF or JPEG files you either create or download from the internet (Google Image search is a good place to start) and turn it into a Silhouette cut file. For all things computer related, the lingo is going to work like this… As an example, if you need to save the file you click file, scroll down and hit save as and then fill out the pop up window and hit enter, it’s going to look like this File–>Save As. Good deal, Lucille? Let’s move on. File–>Open. 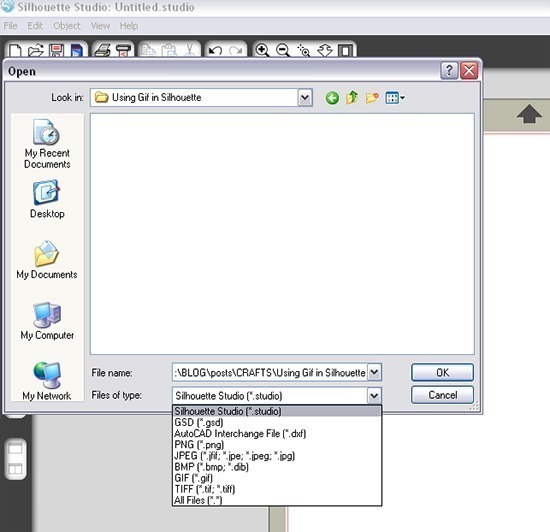 Scroll down in the bottom drop down menu the type of file you are going to be working from. For the first example I used a GIF. All right, now. See our file is in the work area which is exactly what we want. 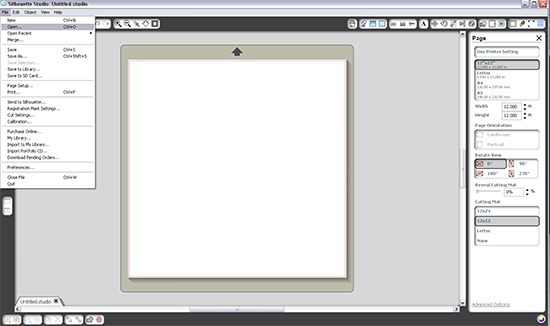 You’re going to need to select the trace icon to open up the options menu on the right side of the screen. When looking at the icons across the top of the program you’ll notice a yellow icon with a blue butterfly inside of it. If you’re colorblind, however, note that it is the fifth icon from the far right. 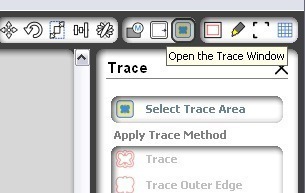 Click on the top bit in the trace menu that reads “Select Trace Area”. 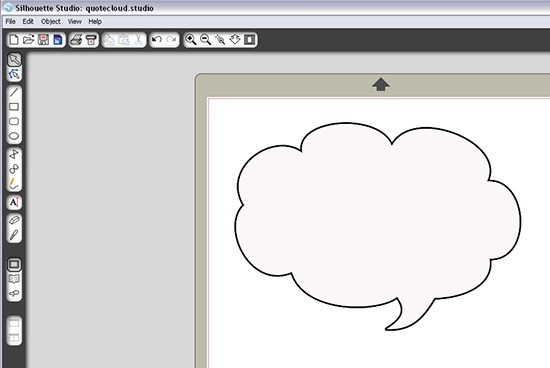 This is a tool that you will use to draw a square around what you want to trace. The blue box you see above is me doing just that. 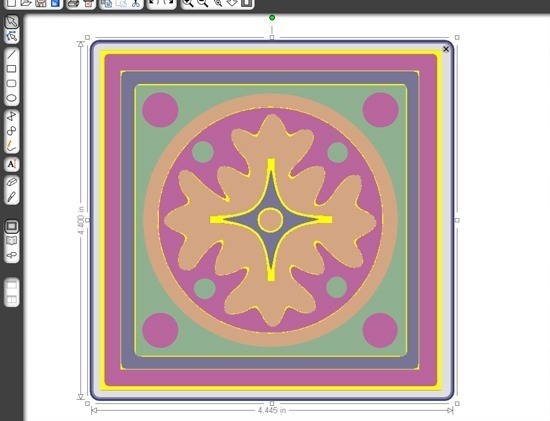 The section below “Select Trace Area” has different tracing options including Trace, Trace Outer Edge, and Trace and Detach. 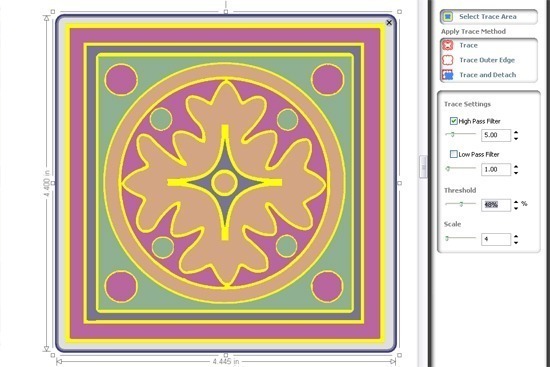 Now I can’t tell you the specifics of each option as I’m still a noob, but I’d assume that they do what they say they do – I just used the plain old trace option and it worked brilliantly. See the red line that is now around the shape? 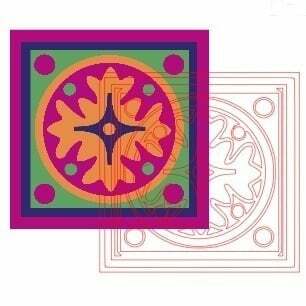 That is my traced cut file. Delete the GIF image imported and you’ve got a cleaned up and absolutely perfect cut file! Fill in the information in the menu that pops up for properties on your library item. Put in as much information as you’d like. If you plan on accumulating quite the library, I’d highly suggest tagging each image with as many keywords as you can possibly find helpful in the future. Hit OK when done and you are finished. Now, just because I’m naturally inquisitive, I decided to see how working with a JPEG file with lots of colors would pan out. It wound up working really well, but needed a bit more finagling. 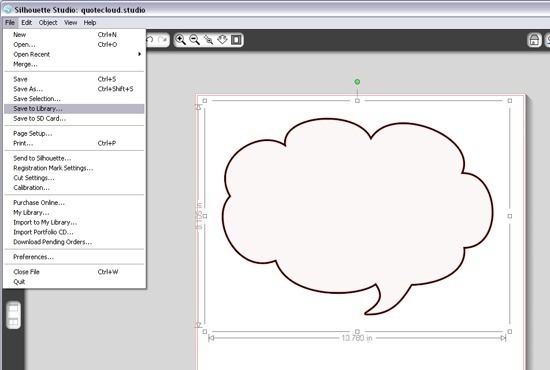 open your file, select the area to be traced and choose the “trace” option. Everything is going pretty well, but it isn’t recognizing everything. Those one dots are being completely ignored! The bottom section in the trace menu has some sliders with other options. This is how we’re going to fix this baby up! First, write down all the numbers as they are before you touch anything. No matter what program you are using, it’s always a good idea to do this so you can always get back to the original starting point. See that little slider that says “Threshold”? That that and slowly move it to the right. Just a few ticks over and now my image looks great and the cuts are going to be awesome. Check it out! The file isn’t perfect but using the tools, can be easily cleaned up to be. Plus, you have a fancy cut shape that cost you absolutely no money, just a little bit of time. I hear you…my first project with the program had me super ticked! Very glad to have helped. Just got my Silhouette today, and I am super thankful for this tutorial. Thanks! Thanks for that. I have managed to trace, but it double cuts as if it cuts the outside line and then inside. When it does second cut, it ‘eats’ the card. Driving me crazy so I would love some tips. Hi, Susan. 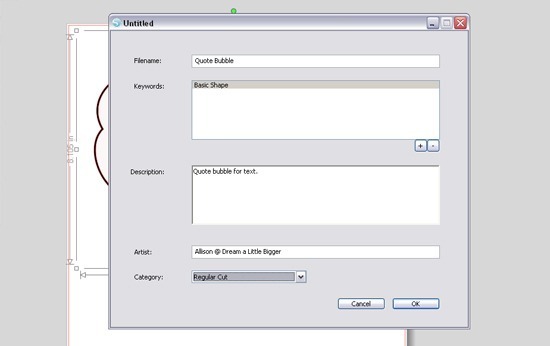 On some shapes it is necessary to clean up the shapes inside of the cut file you create. It’s a pain but sometimes that’s how it goes. Unfortunately I haven’t found a way to fix it except to grab that eraser tool and manually remove the second, inner line. You can also right click and say “break path” on the inner cut line, then right click and delete a point. The subsequent points are super easy to delete. Continue right clicking and hitting delete, but you don’t have to hit the actual point each time, it will automatically go on to next in line! Thank you so much. I went to Modify and release Compound Paths and it has worked beautifully. No idea how much I appreciate that. 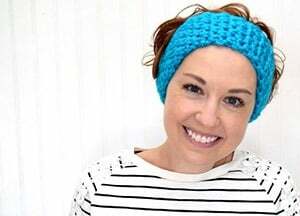 Hey Allison – it’s me..your LIOLI co-host! :) So I just did a google search about importing jpegs into Silhouette and your smiling face popped up along with this brilliant tutorial! Thank you thank you thank you! My issue with the Silhouette ONline Store design is you can’t use any of them if you want sell the items you make with them unless you buy a big old license. So I want to make my own and import and now I know how..thanks! PS did you know I opened Silhouette School? Come check us out – maybe you’d like to guest post (aka substitute teach) some day??? Just wanted to say thank you so much for this awesome tutorial! I had been wanting to design some custom t-shirts for a production and had been putting it off since I thought it would be super difficult to do- thankfully I came across a pin of your tutorial and knocked the whole design out in 10 minutes thanks to you!! Wow! You opened a whole new world full of possibilities for me! This is incredible! Thank you so much for sharing this, and all you generosity! Thanks, Thanks, Thanks!!! What a great tutorial!!! I had some ideas of what my Silhouette could do. I have made so very simple designs/shapes up but this will get me into moving forward again. Thank you. Thank you, I just did my first one! Look out no more paying .99 for an image! Great tutorial. I’m new to the silhouette and struggling a tad but this helps. Also the other issue with the store items is apparently they can’t be used for resale. So for me who sells my cards then I wouldn’t be able to use any of their cut files anyway. do you have to have the designer edition in order to do this? You You justed saved me HOURS and lots of money! Thanks! Incredible!!! This is exactly what I hoped I could do, and it worked out perfectly. Thank you so much for sharing this. Thank you so much for this. I’ve been futzing around with a very old copy of Photoshop Elements, trying to remember how to cut an object out just so I could use it for a cut file. Your instructions were so simple and so clear. Thankyou so much easiest tut ever. Now I have to get them all to line up when cutting Ggrrr. Thank you very much, I have just started messing around with my silhouette over the last week or so. You really helped me out and with the little bit of knowledge that I’ve gained (from my mistakes) I have a really cool graphic! You just saved me all day tomorrow. I got mine tonight and after fighting to get a JPEG to cut a square around what I WANTED, but no idea how I did THAT, I came searching. Tomorrow will be less frustrating. Thanks! Thank you! I have spent so much time trying to convert files without any success. This was so easy to follow and worked! You’re so welcome. Very glad I could help! Thank you so much for writing this brilliant post. It saved me hours of frustration and grey hairs.